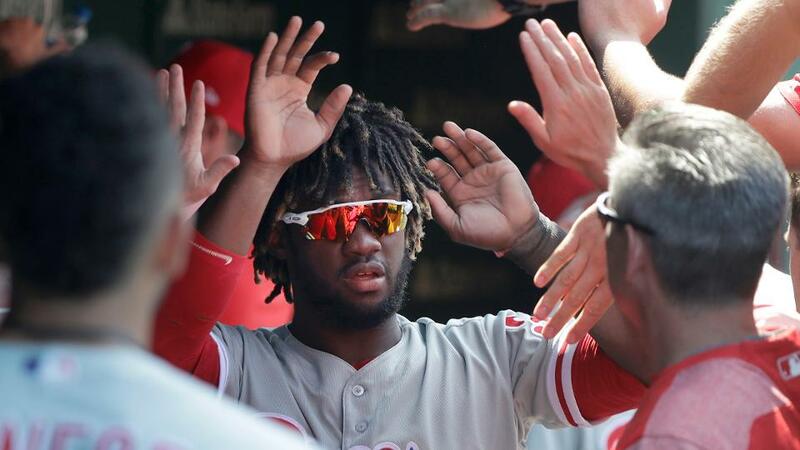 PHILADELPHIA — Odubel Herrera‘s scintillating start got him on the leaderboard in the first voting update for the National League All-Star team. Herrera ranks ninth among NL outfielders with 189,234 votes. He is the only Phillies player among the leaders at any position. Bryce Harper (498,189), Nick Markakis (494,206) and Matt Kemp (351,780) hold the top three spots among NL outfielders. Herrera had a 45-game on-base streak snapped May 20 in St. Louis. It was the fourth-longest streak in Phillies history, behind Mike Schmidt (56 games), Chuck Klein (49) and Bobby Abreu (48). It was the longest in the big leagues since Braves first baseman Freddie Freeman‘s 46-game streak in 2016. Herrera hit .353 with nine doubles, one triple, seven home runs, 30 RBIs and a .978 OPS through May 19. He has struggled since, hitting .163 with three doubles, three RBIs and a .402 OPS in the past 20 games. Fans may cast votes for starters at MLB.com and all 30 club sites — on computers, tablets and smartphones — exclusively online using the 2018 Camping World MLB All-Star Ballot until Thursday, July 5, at 11:59 p.m. ET. On smartphones and tablets, fans can also access the ballot via the MLB At Bat and MLB Ballpark mobile apps. Each fan can vote up to five times in any 24-hour period, for a maximum of 35 ballots cast. Phillies manager Gabe Kapler recently touted second baseman Cesar Hernandez and catcher Jorge Alfaro as potential NL All-Star candidates. Hernandez ranks sixth among 10 qualified second basemen with a .782 OPS. Alfaro is 10th among 12 catchers with a .693 OPS.